Mike Hulme has been studying climate change for over thirty years and is today one of the most distinctive and recognisable voices speaking internationally about climate change in the academy, in public and in the media. The argument that he has made powerfully over the last few years is that climate change has to be understood as much as an idea situated in different cultural contexts as it is as a physical phenomenon to be studied through universal scientific practices. Climate change at its core embraces both science and society, both knowledge and culture. 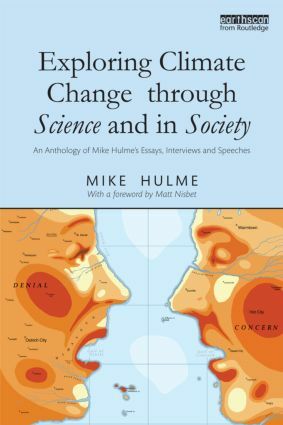 Hulme’s numerous academic and popular writings have explored what this perspective means for the different ways climate change is studied, narrated, argued over and acted upon. Exploring Climate Change through Science and in Society gathers together for the first time a collection of his most popular, prominent and controversial articles, essays, speeches, interviews and reviews dating back to the late 1980s. The 50 or so short items are grouped together in seven themes - Science, Researching, Culture, Policy, Communicating, Controversy, Futures - and within each theme are arranged chronologically to reveal changing ideas, evidence and perspectives about climate change. Each themed section is preceded with a brief introduction, drawing out the main issues examined. Three substantive unpublished new essays have been specially written for the book, including one reflecting on the legacy of Climategate. Taken as a collection, these writings reveal the changes in scientific and public understandings of climate change since the late 1980s, as refracted through the mind and expression of one leading academic and public commentator. The collection shows the many different ways in which it is necessary to approach the idea of climate change to interpret and make sense of the divergent and discordant voices proclaiming it in the public sphere. How good is technology’s weather eye?